· The new SKY VAMPIRE DRON is designed to provide easy maneuverability combined with incredible strength. You could install your GOPRO, ProCam, SJCAM or QMOX for stunning HD images with a 170° panoramic lens. 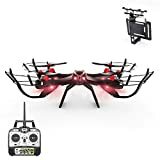 The quadcopter is equipped with a 6-axis gyroscope stabilization system, thanks to which the configuration can be modified and stabilized at any time. Thanks to the advanced features of its remote control, in addition to the normal standard flight functions (forward, back, up, down, right, left) are also possible: the static suspension thanks to the Air Stop function, flights switched flights moved and rotating 3D 360°. The controller has functions to adjust the digital trim. Even the LED navigation lights by visual aid of flights with drones and spectacular night are operated by radio control. The HEADLESS function allows you to control your model without taking into account the orientation of the fuselage head. In other words, the pilot is allowed, without having to worry, looks to the right, left, or even backwards.